Fossils picked up in a Romanian bear cave are the oldest specimens yet found of modern humans in Europe, scientists say. 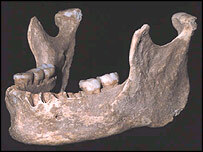 One of the items - a male, adult jawbone - has been dated to be between 34,000 and 36,000 years old. The other pieces, which include the facial bone of an adolescent, are still being tested but are thought to be of a similar age. This puts the fossils - from three different individuals - in a period in history when modern humans are believed to have shared the continent with Neanderthals, their now extinct hominid cousins. Indeed, the researchers reporting the discoveries go so far as to suggest the fossils show some degree of hybridisation - they are possibly the result of interbreeding between modern humans and Neanderthals, they argue. This is a position that drives a heated debate among scientists, many of whom doubt there was much mixing of the species. These researchers point to DNA studies that indicate Neanderthals contributed little or nothing to the genes of humans living today. The new finds, made in the Carpathian Mountains, are sure to prompt further argument. They are detailed by Professor Erik Trinkaus and colleagues in two journals: the Proceedings of the National Academy of Sciences and the Journal of Human Evolution. The team says the fossils, while undeniably modern (Homo sapiens), display some features that are very primitive in nature, such as large molars. "Both the lower jawbone and the upper jaw of the face have the same pattern in the cheek teeth - the wisdom teeth in particular are simply huge. 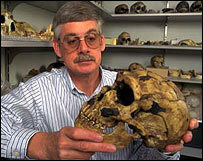 They are bigger than just about anything else we have from the last 200,000 years," Professor Trinkaus told us. "The best explanation I can put on it is that when modern humans spread out of Africa, they interbred with local populations of archaic humans, including the Neanderthals," said the Mary Tileston Hemenway Professor of Anthropology at Washington University in St Louis, US. "It shows us that the earliest 'modern Europeans' were considerably less modern than we normally consider them to be, and that significant human evolution in details of anatomy has taken place since they became established across Eurasia." The fossils were originally discovered in February 2002 in Pestera cu Oase - translated as the "Cave With Bones" - by three Romanian cavers. It is not known how they got into the cave, but Professor Trinkaus says one possibility is that early humans used the site as a mortuary for the ritual disposal of human bodies. The currently most popular model for the emergence of modern humans ties their origin to Africa within the last 200,000 years. This theory argues that a wave of Homo sapiens then swept out across the world to replace all other human-like species, including Neanderthals. Some molecular studies have seemed to refute any possibility that mixing took place - they indicate that our last common ancestor existed before Neanderthals themselves arose. "The problem with this whole debate is that we have so few specimens in Europe - it's hard to make a hard and fast case," commented Professor Clive Gamble, from the UK's Centre of the Archaeology of Human Origins. "The genetic studies are quite convincing but we need more information and that makes these new fossils very interesting. I'm sure that what we deal with eventually is going to be a more wonderful mosaic." In June this year, another group of scientists reported the discovery of the oldest ever modern human remains at Herto in Ethiopia. The skulls were said to be about 160,000 years old. The previous oldest modern human remains in Europe are dated to about 30,000 years ago.